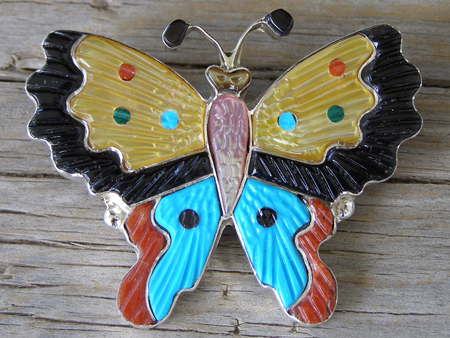 This pretty butterfly made by Zuni artist Tamara Pinto is an excellent example of channel inlay mosaic work with Sterling separating the different mosaic materials inlaid to create this colorful design. Hallmarked Tamara Pinto and marked Zuni on back. Dimensions: 2" x 1 5/8"